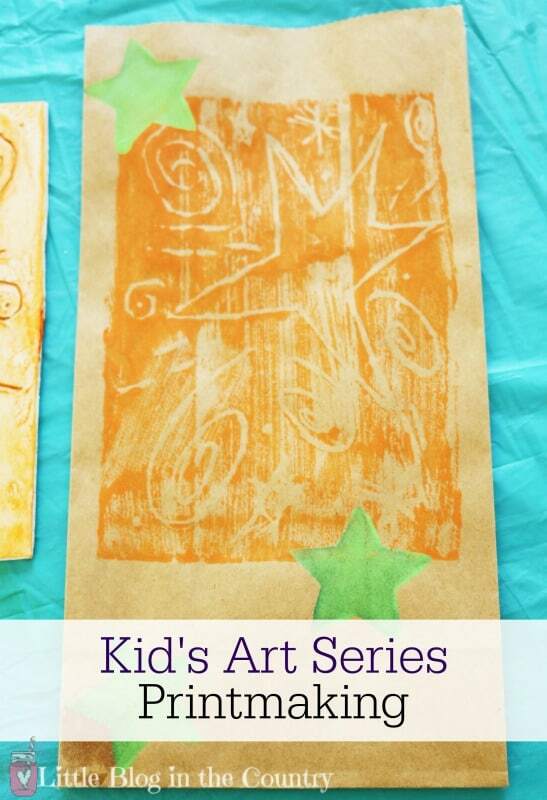 Doing printmaking with your kids or for a class full can be really fun and gives the kids a great way to be creative, even if art isn’t really their talent. 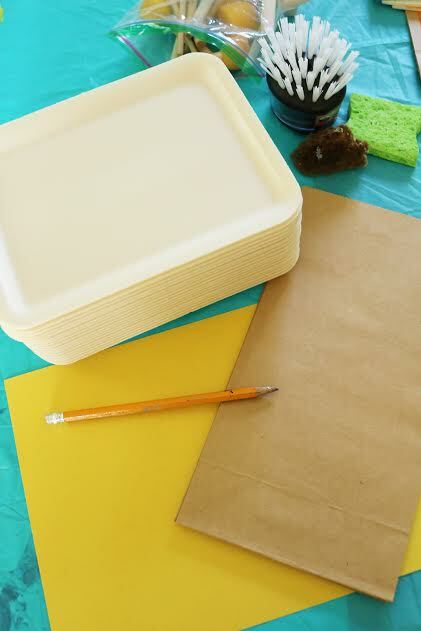 It’s inexpensive to do as well and even if they do something simple and abstract, it looks great when it’s all done! 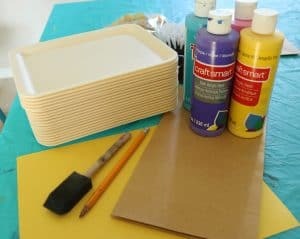 To do printmaking you will need the following items for sure, and then I will give you a list of some extras that you can put in for even more options, some you may already have lying around the house. The foam they will use you can get from your local grocery store – go to the butcher and ask them if they have any of the Styrofoam bases they could donate to an art class, and they will! Depending on the size they give you, you can get more than one out of it, or do one larger one per kid, so figure on at least 1 per child. Acrylic paints – Just go with the cheaper brand at your local craft store, they don’t cost much and if you get them on sale, even better. Various colors for them to choose from is good. Fun things to make textures with like sponges, rollers, dish brush (makes a fun dandelion type print) and anything else they may like to use. Sometimes upcycled things like jar lids can make a cool circular or textured pattern and it shows them how to think outside the box. Cut the rounded edges off the foam pieces so they have a flat piece of foam. One side will have a number or something in it, so be sure to tell them to use the flat side and not that side. 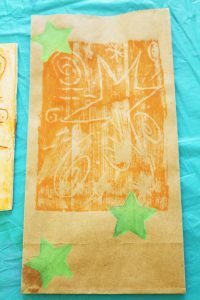 Give them all a paper bag and a sheet of paper (or have them pick the color of paper they want when you’re ready to start. ), a foam brush and put out a few cups of water near the paint stations. Also be sure they all have a paper towel and some near the paints too. 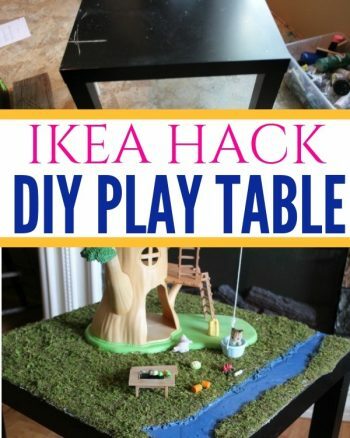 Now, tell them to think of a design or shape they really like, or suggest a few things if they are drawing a blank. Their Initials can be good, but keep in mind that anything the write will print backwards, so explain that to them before they begin. Sun, stars, fish are all easy to do and good suggestions. 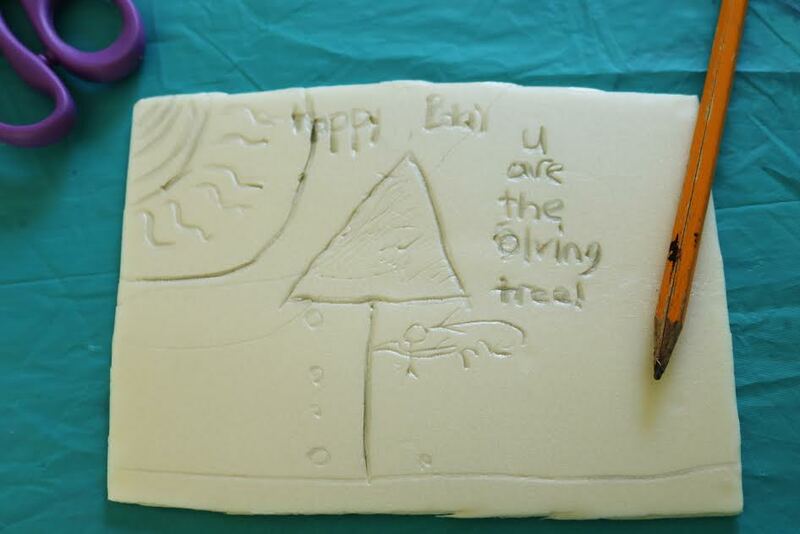 Have them use the pencil and draw lightly at first, shaping and designing their piece. 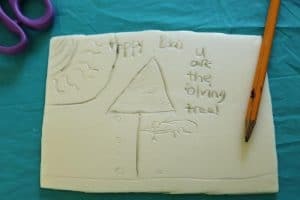 Then once they have the main thing down, let them go over it again with the pencil, making sure it has a depth to it so that the design will show up for sure, but warn them not to poke through. When they are done, they can go ahead and brush on the paint over the foam with the flat brush, moving quickly. If the paint is too thin, it will dry before they can print it. Now help them position it on the paper or bag, making sure to hold it still and pressing down on it all over to make sure it works all the way across. Then gently pull it up. If it doesn’t work due to paint issues or not enough pressure, repaint it and try again, just match up the corners of the print so it matches the first one. Now, just let the print dry for a bit, and if need be, use a blow dryer on low to help it along. Now, if they want to add anything to it, they can use other stamps or things to decorate further. The print is really the main art, so if it’s nice, they may not want to do any more to it. 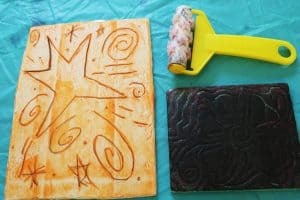 Show them how once they make the foam piece, they can reuse it again and again with other colors of paint. 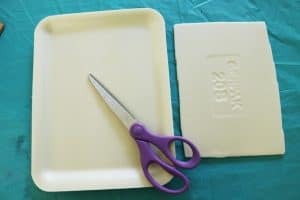 Any stamping or foam rollers work great for this too and so if they really have trouble with the foam part, encourage them to do it with one of those. 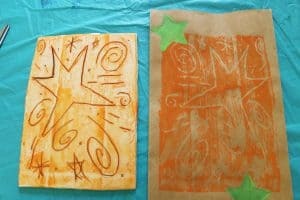 You can also incorporate ink in as another medium instead of the paint, but it won’t work on the foam. 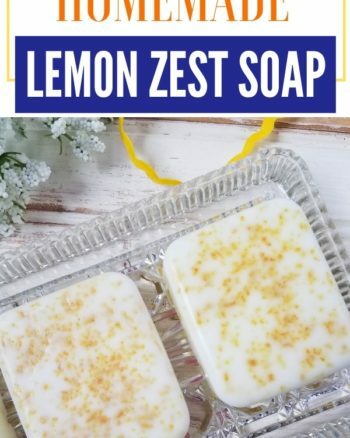 Thank you for posting this fun craft! I am 56 and this would be so nice for a gift bag for any season an also to put in an art journal, as I love this. , for me! 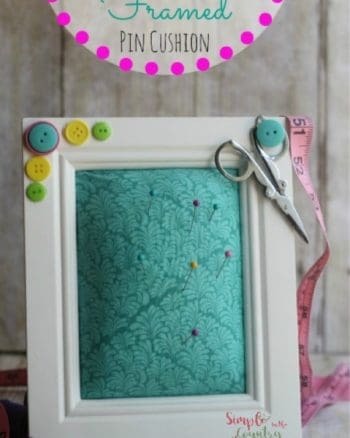 Your easy to follow directions with step by step pics are very easy to follow, and I love the color that was used. with the Paper bag. I will be sure to stop in for more. Thanks for sharing! Judy In Tenn.